Many people use EMC2 as a machine controller. 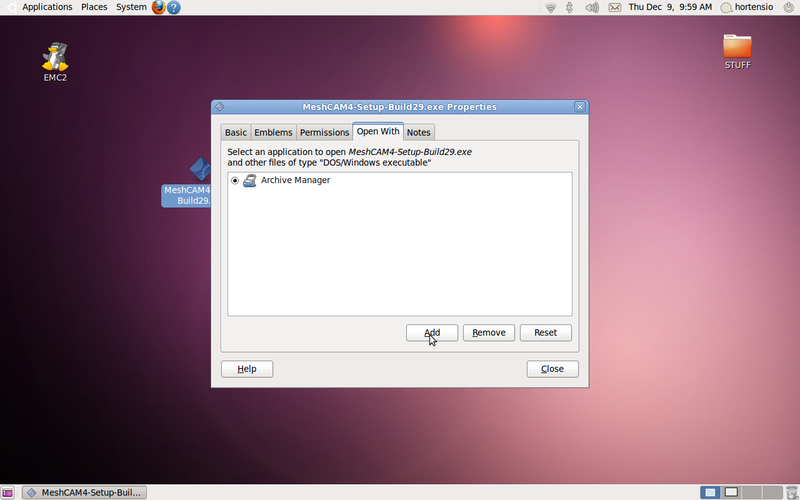 A common problem for Linux users is having to switch between operating systems in their production process since there isn't much CNC software for Linux, most are Windows-only. Users end up designing parts with one operating system and then reboot into Linux to use EMC2. 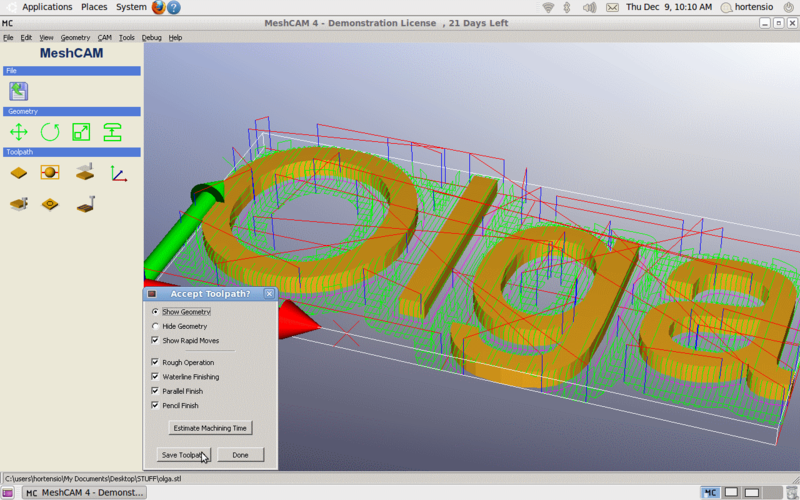 The good news is that MeshCAM works in Ubuntu in many cases and makes it possible to have a complete Linux CNC system. 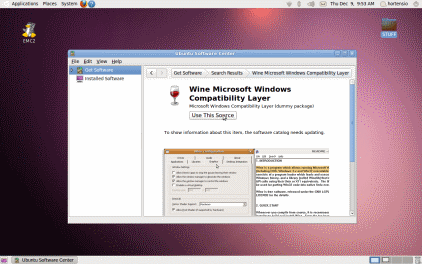 For those who are new to Linux, Wine can be though of as a "Windows emulator". 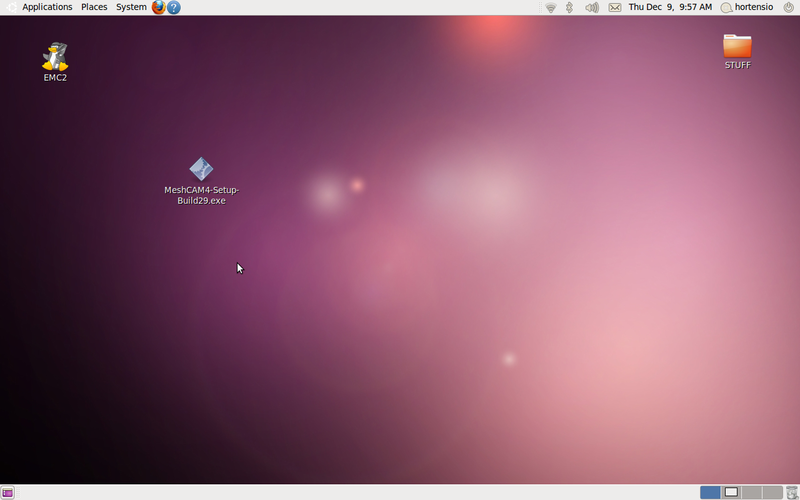 It enables you to run many Windows programs on a PC running Linux. 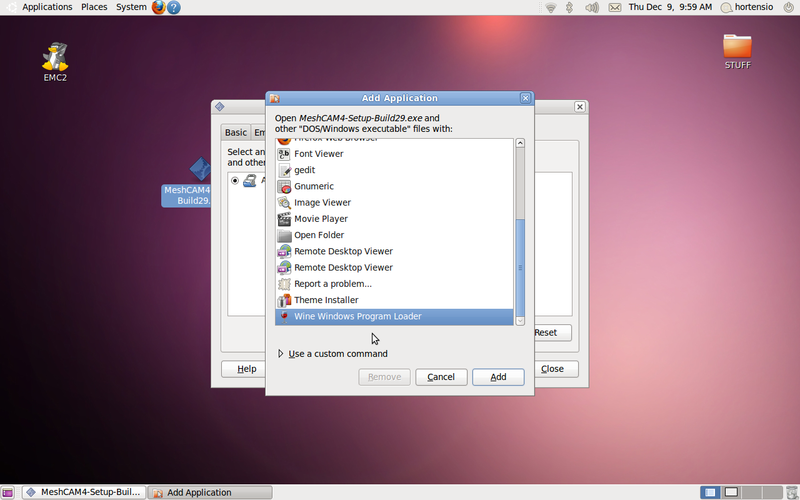 MeshCAM is one of those programs that doesn't mind whether you use Windows or Wine; MeshCAM works very well under Linux and produces excellent results. 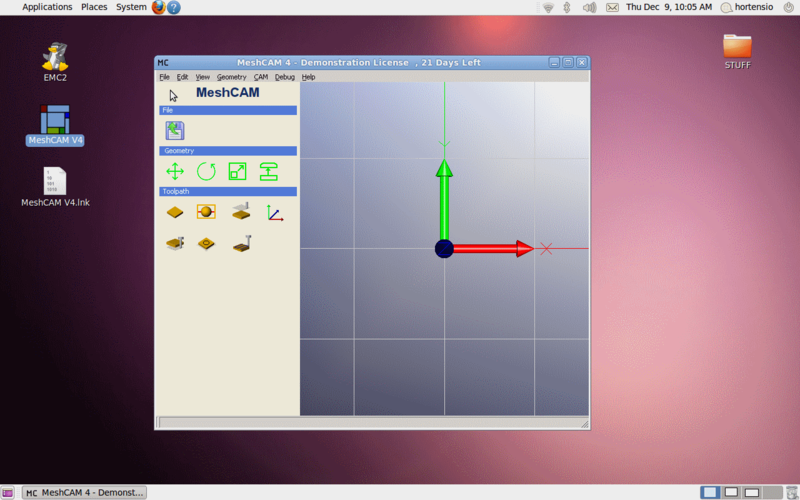 This breif tutorial will guide you through the steps to get MeshCAM running on Ubuntu. First we need a computer. Any computer will do, as long as it not too old, and not too new. 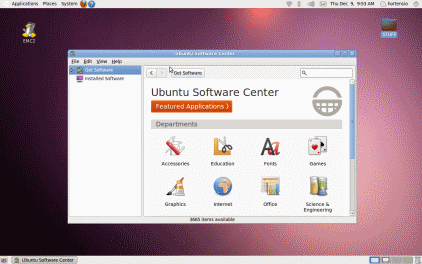 Even though Ubuntu works on most machines you may find that some drivers are not included if you have hardware that is too new. The second thing we will be needing is a CD with Ubuntu on it. 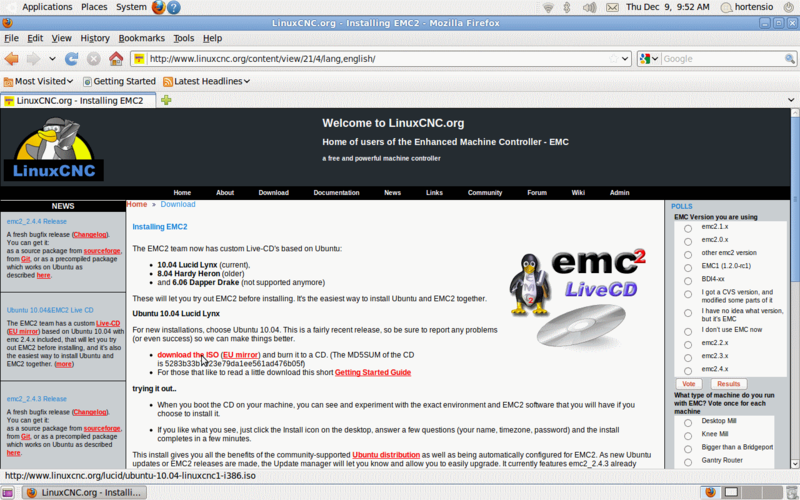 It is strongly recommended that you download the image provided at www.linuxcnc.org. 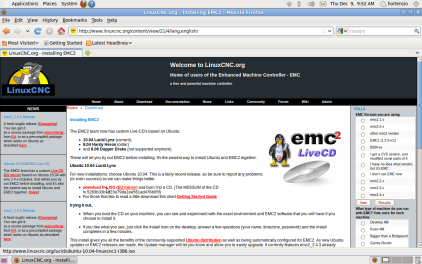 They provide an Ubuntu distribution that already includes EMC2, saving you the trouble of having to install EMC2 separately. This will also guarantee that EMC2 will work properly on your system with a minimum amount of work. The Linux intallation is explained on the cnclinux.org site. Any problems you may have with the installation can usually be solved by visiting their forums. Once Ubuntu is installed on your computer, you need to install Wine. This step requires an Internet connection since you need to download some additional software packages. 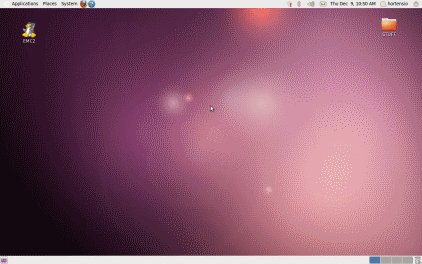 The Ubuntu team has made this task very simple; they include the Ubuntu Software Center for this task. 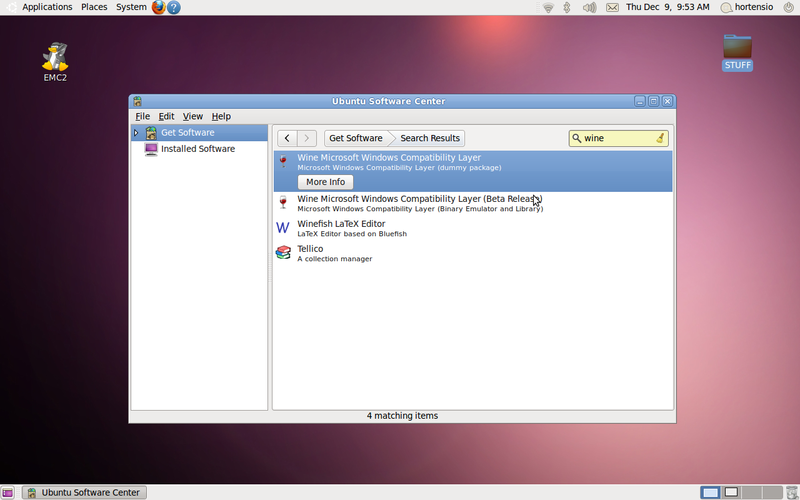 Click on the Applications menu on the top left corner of the desktop, and click on Ubuntu Software Center. The Ubuntu Software Center lets you install and remove many free software programs on your computer. You can search through the repository or you can use the search box at the top. In the search box type "Wine". It should appear within seconds. Click on the "More Info" button, and then the "Install" button, and wait. 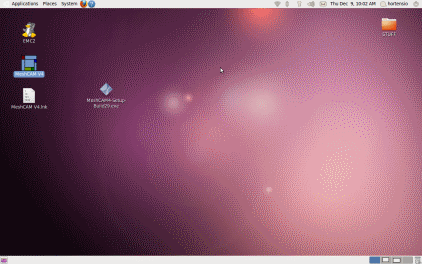 Depending on the version of Ubuntu you have installed the following process may differ slightly. For the purposes of this tutorial, we will use the Ubuntu 10.04 Live CD image from www.linuxcnc.org. Now you can download MeshCAM from the download page. Put the MeshCAM executable install file on the desktop to make it easier to find. Right click on the MeshCAM-Setup file and select "Properties" from the popup menu. Click on the permissions tab. Check that the "Allow execute file as program" box checked. Now we need to make the executable file open with Wine. 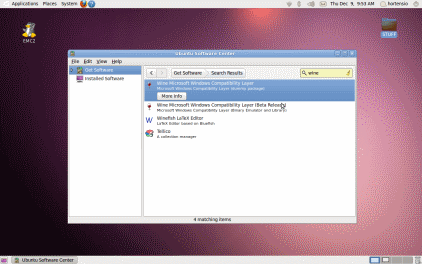 Go to the "Open with" tab, and select "Wine Windows Program Loader". If the Wine option appear, press the "Add" button and a window will appear. 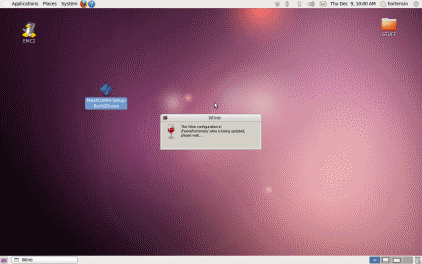 But be warned that all windows executable files will now be opened with Wine if you do this. If you do not want this to happen close the properties window, and right click on the file and select the "Open with" option instead and skip this step. Scroll through the available applications and select "Wine Windows Program Loader". Press "Add" to close this window. Select "Wine" as the default application and press "Close". Double click the MeshCAM setup file. It should automatically start under Wine. The install process from this point is same as Windows. You should now have a MeshCAM icon on your desktop. Double click it and MeshCAM will start up.